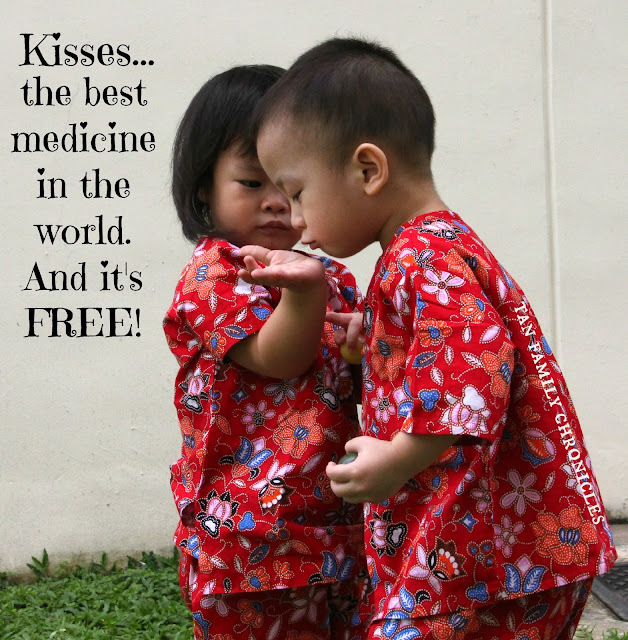 Tan Family Chronicles: Kisses are the best medicine ever! I've so much stuff to blog about that my backlog of posts that's been festering in my mind, is truly staggering. One of them is this picture above that I took of the twins way back in January 2012, when the Asher & Shawna were about 23 months old. We were downstairs our block, in our estate, and I wanted to take pictures of the kids, especially since the twins were decked out in matching outfits. So I had my camera out and ready. Then, from the corner of my eye, I saw Shawna, trip and fall. She was on the grass, and she wasn't running, so it wasn't a bad fall, and she didn't cry at all. Before I could say or do anything, I observed that Asher had also seen her fall, and started walking towards his twin sister. Shawna stood up on her own, and looked at her hand, examining the damage caused by the fall. Without a word, she held up her palm to Asher, and he bent his head to give her palm a kiss, to comfort her over her fall. Unfortunately, I caught them in the above picture just slightly before he planted the kiss. But oh... tears welled up in my eyes. Not a word had passed between them in all that had happened. I quickly recovered and said:"Hey Asher, that was very nice and caring of you to comfort Shawna with a kiss to her hand. Shawna? Are you okay?" They both just turned to me, nodded, and went on walking about the grass patch having fun, as before. As I reflected on it, I realised that they learned this from me. Yes, I'm the sort of mom who would kiss and their hurts away, and hug them to show them that everything is still okay. And young as they were, even before they turned 2 years old, Asher instinctively went to kiss his twin sister's hurt away. Shawna's a tough one, and it really probably didn't hurt very much, but she allowed her twin brother to comfort her anyway. And I loved that. Asher has always been one to show lots of empathy. There was a time I strained my lower back while conducting a roadshow for my business My First Games (games are heavy!!! ), Asher heard me complaining about the aches to hubbs and he asked me "Mummy, where is your pain? Show me where?" I pointed him to my lower back, and he proceeded to rain my lower back with many kisses, kissing my hurt away. He is so sweet! When I accidentally bump my knee against the kiddy table, I'd go "Ouch!" and Asher and Shawna would immediately ask. "Why you say Ouch!, Mummy?" And I'd reply "Oh, I bumped my knee against the table, and it hurts." Asher will quickly bend and kiss my knee. The same thing happened when I stubbed my toe and he wanted to kiss my toes! I quickly stopped him though "Asher, Mummy's feet's dirty! Don't kiss!" He looked up at me and said "But it hurts, right?" I said "Yes, it does, but it's okay, you can make it better by giving me a big hug and a kiss on my cheek, okay?" And so he did. One time, my cousin who has migrated to Australia, came back for a visit and we were having a family gathering. He read a story to one of my other cousin's daughter, and when the story ended, he asked for a hug as a thank you. Being unfamiliar with him, my niece refused to hug him. My cousin feigned obvious disappointment and shortly after, walked out of the room to get a drink. Asher saw all of this happen and he followed my cousin out of the room. He walked to my cousin, tapped him on his hand, and said "I will give you a hug." I am that cousin and I was so surprised by his sweet gesture and obviously delighted. He is a very sweet kid. This is such a sweet and heartwarming post. Asher is such a darling! Such a sweet episode! Asher really does have a lot of empathy, and I'm impressed that it shows even at such a tender age of 23 months! I was actually wondering if it's something that's learnt and emulated, or something that's innate and woven in a child's personality...I guess it's always a mix of both. What a sweet boy he is (And lucky mama you are too)! Thanks for linking up to Little Lessons!